You regular readers might recall that I’ve been having some trouble getting into my reading this summer. So I thought that Francine Prose’s Reading Like a Writer – A Guide for People Who Love Books and for Those Who Want to Write Them might be just the ticket to inspire me in both my reading and my writing. 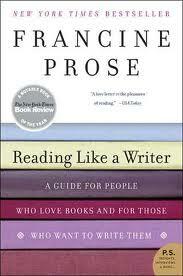 Prose is a prolific author, critic, and essayist who also teaches literature and writing. And, IMHO, she has the best last name for a writer ever. The book often has an accessible academic tone to it, which made me feel as if I were sitting in on a lecture given by a very smart and personable professor. After we understand the power of words, we move on to sentences. I hope we all have had the experience of reading such a perfect sentence that we’re almost reluctant to leave it behind. Regardless of length, a sentence should be strong and clear. It’s not a sin to write a sentence that is a hundred words long; if it is beautifully readable, it’s okay to ask the reader to stay the course. After sentences come paragraphs, which provide rhythm and momentum. And once this framework of the ‘house’ is complete, Prose lets the characters in and examines their dialogue, details, and gestures, pointing out which types of attributes ring true and which ones fall flat as clichéd pancakes. Throughout the book, analysis of excerpts from a variety of authors—Jane Austen, Jonathan Franzen, and Anton Chekhov among them—offers inspiration (and occasionally intimidation). Reading Like a Writer did indeed inspire me to make a bigger dent in my to-be-read stack, but it also made me want to read more carefully, to slow down and pay closer attention to the words on the page. Are you a speedy reader or do you take the time to savor the words? I'm both. When I'm reading heavy literature, I slow down and savor it, but if I'm reading a romance or a mystery, I tend to go faster and just enjoy the characters and the dialogue. But from reading this, I realize I shouldn't take them for granted at all. I love to lose myself in a suspense novel or thriller that makes me read as fast as I can to see what happens next. Like Marlena, I slow down for the classics (or old favorites I'm rereading). Makes sense, ladies. We don't always drive at the same speed either, do we? I've had that book on my shelf for quite some time. It might be time to take it down. Slowing down is sometimes difficult when reading a book that totally hooks you, but that is probably when we need to do it most.